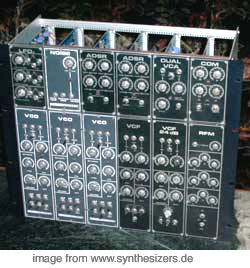 - DIY modular synthesizer: formant , tips, etc..
german: über Modulare Synthesizer Systeme..
MODULAR SYNTHESIZER - URLs and DIY links & Stuff..
you can get modular synthesizers from these companies, lots of them listed here in the moogulatorium..: I listed the highlights..
deutsche/ britische.. ANALOGE synthesizer / german distribution german/british and other synths.. vertrieb jomox, vermona, macbeth, mfb / fricke etc..
the small µventuryII from lassence belgium..
seems new, somewhat moogish synthesizers like synthesizers.com and syntech.com do..
the A 100, good prices.. and cheap interfaces! a vacuum tube synth (röhrentechnik) - the first synth filter that has 4 tubes for BPF (well it's the only one I know of..) sounds nice & sick ;) comes in a 19" rack Metasonix info here on the page..
http://www.cyndustries.com they have a nice jp8000-style but full analogue supersaw-type phattness module! and many more..
the motm.so called ("mother of all modulars") from synthesis technology paul schreiber. big modular from switzerland.. clear sound, high quality..
this is the best known DIY Synth project in germany..
and even a nice sequencer "groovegenerator"..
digital? there is the clavia nord modular / g2, creamware pulsar (modular 2 and modular 3) software? native instruments reaktor! 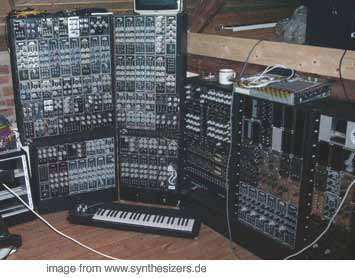 and lots more..
the older systems of ARP (2500, 2600 (semimodular)), Moog, Roland, Buchla, Korg (semimodulars) etc..
very special machines can be found here. for converting and lots more.. maybe interesting for modular systems and very special systems..
Theremin DIY & to buy..
see all these modular systems? please check the menu.. start with moog, roland etc. and this one..
this is just a list of the manufacturers urls..
ein offener Formant.. sind Curtis Chips drin! opened formant with curtis chips inside! 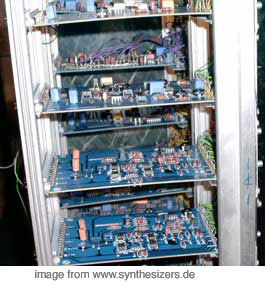 the formant was a project of the german electronics magazine "elektor" and is continued by helm electronics. (Hans-Joachim Helmstedt) in germany. the newer MSS2000 Formant Model is the current project.. on the site you can get some more info, but currently german only. if you need switched trigger and want to midify it: thry to use voltage trigger= 0 v and 8-10V as "sitched" trigger for moog. 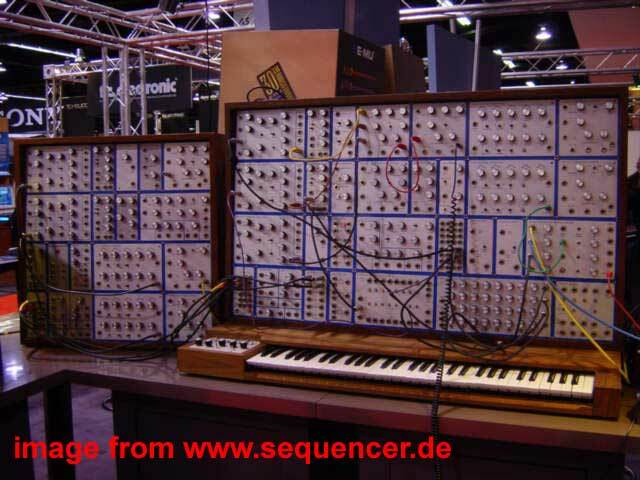 it works on prodigy and others..
dieser Sequencer ist nichts anderes als der MAQ16/3 von doepfer zum nachbauen. buttons for TR808 / Jupiter 8 etc.. see roland section..
über modularsysteme.. generell.. / auch und vor allem für einsteiger..